Hooray! The 2017 Ultimate Pinterest Planner is here! My assistant, Amanda, whom you met in the last episode, is talking with me about why we created the planner and how to get the most out of it for your Pinterest marketing. Perhaps you think that only Pinterest “experts” would ever need a Pinterest planner, but everyone could use a Pinterest planner. It is perfect for the newbie to the much more experienced pinner. If you are an advanced Pinterest user and it seems like a lot of work to take care of your Pinterest account, this planner will help you tackle that, with options to print out your pages, and gain control of your Pinterest account all year long. For those newer to Pinterest, this planner will literally tell you exactly what to do every month. What is the Pinterest Planner? This planner is a FREE PDF download that goes through a series of “what-to-do’s” for each month throughout the year. One of the topics we talk about a lot is the “trending topics” term. We have compiled a list of these for each month, so you will know what to look for when each new month rolls around. We also have a list of action items for each month. 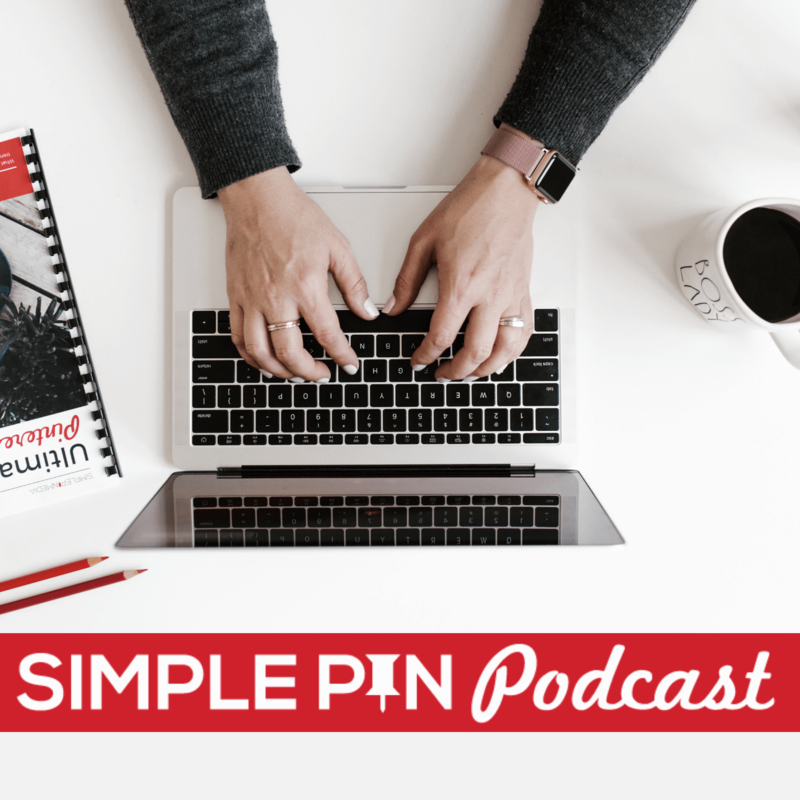 This may be what we are working on here at Simple Pin; we give you ideas for pr23omoting your Pinterest account, as well as being optimized. We want this to be a simple way for you to organize your Pinterest marketing, within a user friendly PDF file, and to completely take away any feelings of overwhelm. One of the main reasons is because I am passionate about helping business owners simplify wherever they can, especially with Pinterest. But I also wanted to grow my email list. I knew that I needed to have something to give to people in exchange for their email. Like we talked about in this how to build your email list podcast episode. The idea of a calendar or planner came to mind. I wanted this tool to be so valuable and so helpful that I decided to go big and do an entire calendar year planner, and offer it for free. At the time, my email list was the only way I was communicating with people; this allowed me to continue to reach even more people with my Pinterest tips and tricks. When it came down to it though, I wanted a Pinterest planner that was not only helpful, but cute! And there was nothing on the market at that time that fulfilled that need. As soon as you open the planner, you will see a welcome note from me along with some helpful tips on using the planner. There is a section on switching your boards around as the seasons change also. You don’t want your Christmas boards at the top in the middle of the summer; so this helps you keep your boards fresh. We also talk about an action item or two to keep you from being overwhelmed. The idea is to take just a few things at a time instead of fifty. We talk about updating and optimizing throughout the year; how to go in and re-edit images, or update your board descriptions, etc. Make sure and join our exclusive Pinterest strategy group on Facebook and at the beginning of each month we’ll add an additional action item that is directly related to a recent change on Pinterest or something to do with your account. For each month, there will be a list of trending topics for that month, along with keywords, topics to cover, basically anything you need to be paying attention to, especially as it relates to your niche. We also have a section on Promoted Pins. I am a huge fan of Promoted Pins and have seen some great success in using them, and I want to help other Pinterest users take the leap into using them too. We’ve added a few bonus sections to the planner this time. First, a tracking page. You can use this to track stats of all kinds- pageviews, followers and repin rates. These are the stats that we track here at Simple Pin for our clients. Keeping up with these each month ensures you’re staying on top of trends in your traffic. One of our most popular downloads here at Simple Pin is our “How to Clean up Your Pinterest Boards” cheat sheet. It is also included in the planner. This sheet walks you step by step through getting your boards cleaned up so you’re left with a branded look on your profile. This year, we are adding an exclusive bonus in the planner that we aren’t offering anywhere else. This is our Team Planning Checklist. This is something that our own team uses everyday to ensure we’re checking the Pinterest marketing boxes. If you have or are thinking of getting a virtual assistant, this will be an invaluable tool for you. With this checklist, you are telling them exactly how to Pin to your account. We are also this year including The Quick Start Guide to Promoted Pins. We understand that it can feel crazy overwhelming to think about getting started with Promoted Pins, so this will help you to get started as easily as possible. Tip: Last year several people had it printed at their local office store (or at home), and then had it bound. The planner comes in at just under 20 pages, so should be under $10 to print. And as always, we would love to hear from you and how the planner is working for you! Please comment below or tag us using your planner on social media @simplepinmedia! Thank you so much for this planner! I just signed up to get my copy but I can already tell that it’s going to be really helpful and awesome! Glad to read your informative post! I really love your attitude regarding business enhancement. You always looks serious when it comes to help any business owners in subject of Pinterest. Email list are considered as healthy strategy to grow our business. Eventually, thanks for sharing your worthy thought with us. Convert Kit was down. It should be working now. Thank you! I’m planning for bigger and better and this will help. This is an amazing pinterest strategy planner!! I’m so excited to dig into it! I have a very new blog, http://planfamilyfun.com and need to get my pinterest plan going. I have downloaded the planner today and super excited to print it out! Thanks so much! This is fantastic, thank you so much! I started on Pinterest back when you needed an invitation, and was really into it for a long time. Then I started focusing on Instagram and let Pinterest go, but now, I have two businesses, and am trying to ramp up my Pinterest accounts again. This will be incredibly helpful! May I ask you a question? A business mentor advised me that the first 8 boards on my account should only have my images (I’m a photographer), not mixed with other content, and to keep mixed boards below the top 8. What are your thoughts on that? I’m not sure it matters as much, but the boards that do display your work should only be your content. Being in the top 8 doesn’t really matter, however, I do like to have boards that showcase your content at the top. How many doesn’t matter as much. I tried your tip for April and pinned food on Sunday, I also followed about 5 new bloggers. My followers increased by 88 in 4 days! It took me two years to get from 190 to 300 followers and a weekend to go from 300-388; amazing. I’m following the planner like a rule book for the rest of the year. Thanks so much for making it.